Teach Yourself VISUALLY iPhone is your ultimate guide to getting the most out of your iPhone! 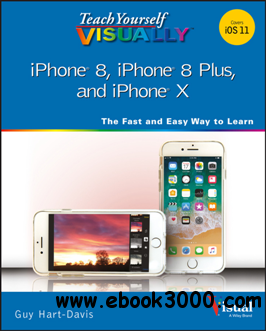 Apple's graphics-driven iOS is perfect for visual learners, so this book uses a visual approach to show you everything you need to know to get up and running-and much more. Full-color screen shots walk you step-by-step through setup, customization, and everything your iPhone can do. Whether you are new to the iPhone or have just upgraded to the 7s, 7s Plus, or 8, this book helps you discover your phone's full functionality and newest capabilities. Stay in touch by phone, text, email, FaceTime Audio or FaceTime Video calls, or social media; download and enjoy books, music, movies, and more; take, edit, and manage photos; track your health, fitness, and habits; organize your schedule, your contacts, and your commitments; and much more! The iPhone is designed to be user-friendly, attractive, and functional. But it is capable of so much more than you think-don't you want to explore the possibilities? This book walks you through iOS visually to help you stay in touch, get things done, and have some fun while you're at it!